It’s been a long crawl. For loggerhead sea turtles, however, nesting in Georgia is definitely trending upward. Sea Turtle Program Coordinator Mark Dodd with the state Department of Natural Resources announced the milestone news during the fall meeting of the Georgia Sea Cooperative. Members patrol beaches daily during sea turtle nesting season, providing the people-power needed for nest protection and management. “This is what we’ve been waiting for for 20 years,” Dodd said. His analysis showing a statistically significant nesting trend for the federally listed turtles comes on the heels – or flippers – of three record seasons. Totals surged from 1,761 nests in 2010 to 2,218 in 2012. This summer’s count easily eclipsed the 675 nests recorded in 1989, the start of comprehensive nest surveys in the state. Read more, including year by year nest counts! "Cumberland Island was fortunate to have 700 turtle nests this season, which is a record-setting year for us. It reflects the many years that conservation efforts and monitoring have been done on Cumberland, thanks to the good work of many dedicated professionals in our Resource Management staff." Support conservation of loggerheads and other nongame wildlife in Georgia through buying an eagle or hummingbird license plate, donating to the Nongame Wildlife Conservation Fund income tax checkoff or contributing directly. The fund is dedicated to conserving wildlife not hunted or fished for, as well as rare plants and natural habitats. Which bald eagle would you prefer on your bumper? You have until Nov. 7 to help decide which bald eagle design will be in the next set of Georgia’s nongame wildlife license plates. With more than 18,000 votes cast in a recent survey, two eagle images proved the most popular. Yet the designs depicting the national bird against a U.S. flag and flying over a lake finished neck and neck. A runoff is being held online (vote here). The lead eagle and top designs for trout and bobwhite quail restoration – two other DNR tags included in the previous survey and benefiting conservation – will be announced in December. The agency will also provide an update on when the new designs will be available. The current eagle plate is the most popular specialty plate in Georgia. It’s also a high-flying contributor to conservation of rare and other nongame wildlife, whether it's big raptors or golf ball-sized mussels. The eagle and hummingbird tags provide two-thirds of contributions to the Georgia Nongame Wildlife Conservation Fund. The fund is critical to the Wildlife Resources Division’s Nongame Conservation Section. The section receives no state appropriations but depends on contributions – such as through nongame plates – to help conserve animals not legally hunted or fished for, plus rare plants and habitats. Specialty plates cost $60, plus taxes and other fees standard for all plates. The annual renewal fee is $35. For each sale and renewal, $10 goes to the Nongame Wildlife Fund. Once new designs are in place, owners can keep their old wildlife plate or buy a new one. The same purchase and renewal fees apply. As with the current nongame plates, new ones will have "Give Wildlife a Chance" in place of the county name. One of the nation’s most successful fundraisers for wildlife conservation turns 25 on Sea Island Feb. 8-9. Starting much sooner – Nov. 1 – you can register for Weekend for Wildlife’s silver anniversary. Restore populations of rare wildlife such as red knots and the robust redhorse, and natural habitats from Coastal Plain sandhills to Southern Appalachian mountain bogs. Acquire key conservation lands, including about 37,000 acres along the Altamaha River, land open for public recreation. Research native animals and plants like Rafinesque's big-eared bats and Georgia rockcress to better understand their conservation needs. Educate thousands of Georgians a year about wildlife conservation through regional education centers and other outreach. Scan the Weekend’s Wild Success Stories at http://weekendforwildlife.wordpress.com. Weekend for Wildlife accounts for about 15 percent of contributions to the state's Nongame Wildlife Conservation Fund each year. That fund powers DNR’s Nongame Conservation Section, which receives no state appropriations to conserve rare and other native nongame. But the impact ripples wider. In 2011, 30 percent of Georgians 16 or older took part in wildlife-watching activities such as bird feeding – and more than $1.8 billion was spent on wildlife watching in the state, according to a U.S. Fish and Wildlife Service survey. Wildlife watching is recreation often focused on nongame species. The conservation that Weekend for Wildlife champions is good for Georgia wildlife and the state’s economy. Based at The Cloister resort on Sea Island, Weekend for Wildlife treats guests to outdoor adventures, exciting auctions and a five-star banquet. Gov. Nathan Deal and First Lady Sandra Deal will attend, with Sandra Deal serving as honorary chairperson, as she did in 2012. Click here or call (706) 557-3337 for registration and other details. Two juvenile Florida panthers on the lam from White Oak Conservation Center near the Georgia/Florida line in Yulee, Fla., are being tracked by state and federal wildlife officials. The endangered cats, male and female siblings outfitted with radio collars, escaped when winds from Hurricane Sandy topped a tree onto their pen fence. A tweet “chat” about North Atlantic right whales is scheduled for 2-3 p.m. Nov. 8 with NOAA disentanglement coordinator Jamie Smith and marine biologist Barb Zoodsma. Follow the conversation or tweet questions via @NOAAFish_SERO. Whitfield County seventh-graders helped DNR Fisheries Management stock lake sturgeon into the Coosa River basin Oct. 17. The fingerlings, raised at the Go Fish Center and Summerville hatcheries, are part of a long-term effort to restore the species to the northwest Georgia river system. Keynote speaker Douglas Tallamy (“Bringing Nature Home”) and vendors such as Nearly Native Nurseries and the Georgia Forestry Commission are part of the Georgia Exotic Pest Plant Council's annual meeting and conference Nov. 8. The meeting, held at the University of Georgia’s Griffin campus, is geared for Georgians who want to learn more about invasive species. Georgia’s red-cockaded woodpeckers are adding to populations of the endangered birds in southern Florida. Five pairs from Fort Stewart were recently released in the John G. and Susan H. Dupuis Jr. Wildlife and Environmental Area, while another three pairs from north Florida were moved to the J.W. Corbett Wildlife Management Area. Speaking of pollinators, this video by Louie Schwartzberg offers an amazing look at animals and plants involved in “The Hidden Beauty of Pollination.” Schwartzberg is an award-winning cinematographer, director and producer. 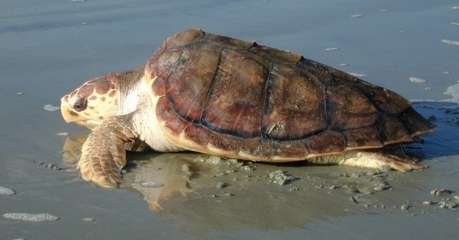 While loggerhead nesting is up, so are sea turtle strandings on Georgia’s coast. There have been 191 strandings this year, the most since at least 2007 through the same period. Save the hummingbird feeders! Or at least keep them up and full in fall and winter, offering nourishment to hummers from the western U.S. and Central America that often show up in Georgia at this time of year. Fees at most U.S. Forest Service day-use sites will be waived over the Veterans Day holiday weekend, Nov. 10-12. In the Chattahoochee-Oconee National Forest, participating areas will indicate at the fee stations whether entrance is free. The Interior Department’s Partners in Conservation award winners for 2012 include two Everglades restoration initiatives, the Everglades Headwaters National Wildlife Refuge/Conservation Area Partnership and the Everglades Cooperative Invasive Species Management Area. 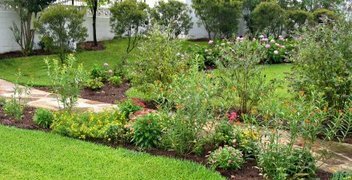 The Georgia Plant Conservation Alliance has a new Facebook page. Check it out. The fall issue of Texas’ Eye on Nature newsletter provides a rich look at prescribed fire and its role in managing wildlife and renewing habitat, following the “tinder box” summer of 2011. Download a copy. November bird-banding opportunities for volunteers organized by Georgia Important Bird Areas Coordinator Charlie Muise include: Joe Kurz WMA – 7:15 a.m. Nov. 2 and (tentatively) 6:30 a.m. Nov. 16; Panola Mountain State Park – 6 a.m. Nov. 10 and 6:15 a.m. Nov. 25. Details: Email Charlie Muise. Nov. 10: Start of 2012-2013 Project FeederWatch. 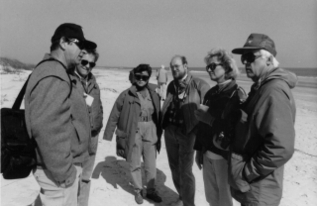 Nov. 17: Fourth annual Right Whale Festival, Jacksonville Beach, Jacksonville, Fla.
** A snapshot on Sapelo Island from the first Weekend for Wildlife (1989). ** DNR's David Waller and his wife talk with famed ornithologist Roger Tory Peterson at the 1995 Weekend. Learn more about the Nongame Conservation Section in our annual report.